It is often said trends in Australia follow the United States, and a new report supports that theory in terms of the growing fondness Australians have for eating out instead of at home. ABARES’ new Food demand in Australia report highlights how strongly the trend away from home cooking towards eating out has grown in Australia in the past 30 years. Average per person expenditure on meals out and fast food increased from $932 per person in 1988-89 to $1608 per person in 2015-16. The main influences on food demand growth in the past 30 years, according to the report, were population growth (58%), growth in real income per person (33%) and changes in tastes and preferences (12%) while higher real food prices had a slightly negative impact on food demand growth (-2%). 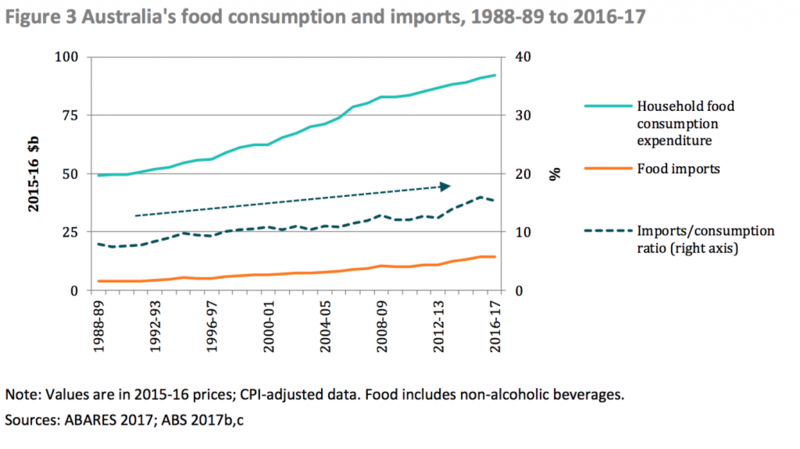 The above chart shows that while expenditure on eating out has increased, expenditure on the main food types has largely stagnated changed in real terms in the past 30 years. Average per person expenditure on meat, fish and seafood has declined from $734 per person in 1988-89 to $650 per person in 2015-16. Australia is now a net food importer in six categories: seafood; processed fruit and vegetables; soft drink, cordials and syrup; confectionary; bakery products and oils and fats.